You can knit, sew and crochet your own handmade hats from a range of yarns and fabrics. From light sunhats to thick winter caps, you're sure to find a pattern that suits your style. You can find patterns for hats in a number of places. Fabric stores and yarn stores often carry a range of patterns for sale. It's sometimes possible to reverse engineer a design you like, making your own pattern from an existing hat. On the Internet, you can find patterns and instructions to download for a reasonable price or even for free. Hats can be made using a number of different materials. Hats for cold weather can be knitted or crocheted, or sewn from thick fabric such as fleece. Light sun hats can also be made with yarn, provided it is thin and breathable and the pattern is suitable. 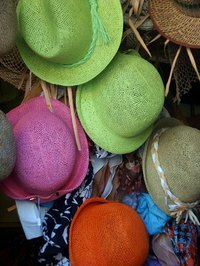 Hats can also be woven from straw and other materials. If you're making a hat that's intended to shield your head from the sun, make sure that the fabric is thick enough to offer protection from the sun's rays. Be especially careful with hats for babies and children. Thin fabrics may offer very little protection.